The exams period during primary and secondary school is a very stressful period to all children and teenagers, no matter if they live in Germany, South Africa or in Uruguay. For Palestinian students, however, this is an extra stressful period of the year. The Headmaster of As Sawiya School talks to soldiers as they prevented children from getting to school on 3 December 2014. Photo EAPPI/A. Tesche. Israeli soldiers and authrities outside As Sawiya School. Photo EAPPI/A, Tesche. During exam periods, the Israeli army often increases their presence in and around Palestinian schools. Hyped-up by their encounters with the soldiers, it is extremely difficult for students to concentrate on their studies in the classroom. Soldiers lay down while outside As Sawiya School. Photo EAPPI/B. Viney-Wood. Soldier light up a cigarette while outside As Sawiya School. Photo EAPPI/B. Viney-Wood. 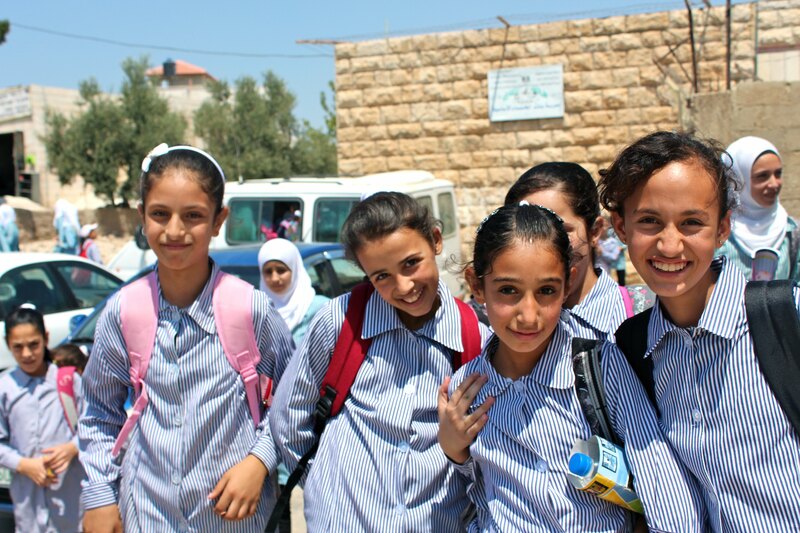 EAPPI does school runs as part of its Access to Education initiative, which aims to guarantee children’s access to education despite the hardships of the Israeli occupation of the West Bank. The aim of the school runs is to offer protective presence to children on their way to and from school and monitor human rights violations against the children. On 3 December, we witnessed first-hand the difficulties of going to school for Palestinian children during exam periods. On this day, Israeli soldiers prevent children and teachers from getting to school. We arrived on the scene at 7:40 am and stayed until all were allowed to enter school around 8:15 am. When asked why they closed the school, soldiers responded that there had been stone throwing the day before. The headmaster of the school informed us, however, that he was at school the previous day until 2pm and there had been no stone throwing. Israeli soldiers watch as boys walk to As sawiya school. Photo EAPPI/R. Viney-Wood. Boys wait to get to As Sawiya school. Photo EAPPI/R. Viney-Wood. School girls ask why they are not allowed to go to As Sawiya school. Photo EAPPI/R. Viney-Wood. Israeli soldiers walk towards As Sawiya school. Israeli soldiers are frequently present as children go to and from school in As Sawiya. During exam time, they increase their presence. Photo EAPPI/R. Viney-Wood. Female teachers ask soldiers why they are not allowed to go to As Sawiya school. Photo EAPPI/R. Viney-Wood. *Find more Access to Education resources. On November 18, a group of Israeli settlers came near the school in ‘Urif and began to throw stones. 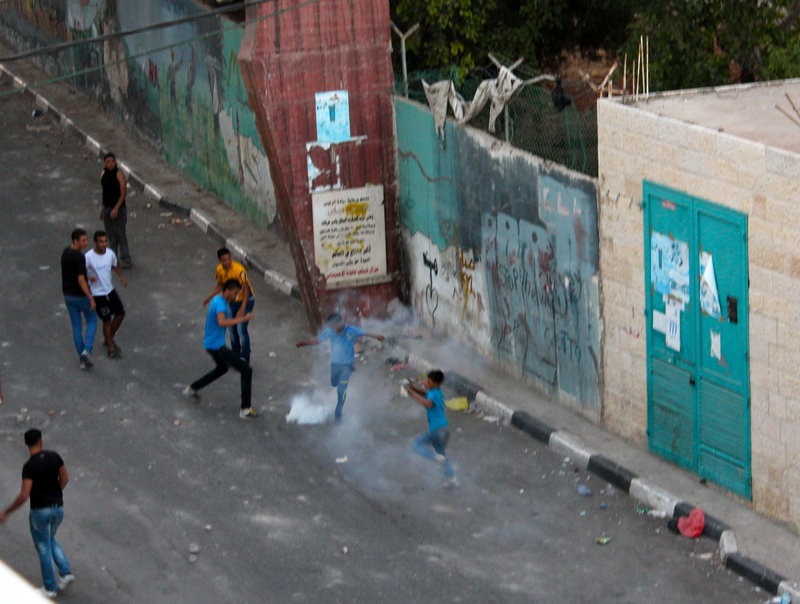 Later, the Israeli military arrive and shoot tear gas into the school yard. EAs were there to catch it all on film for you. ‘Urif boys school suffers from frequent settler harassment and violence from the Israeli military. 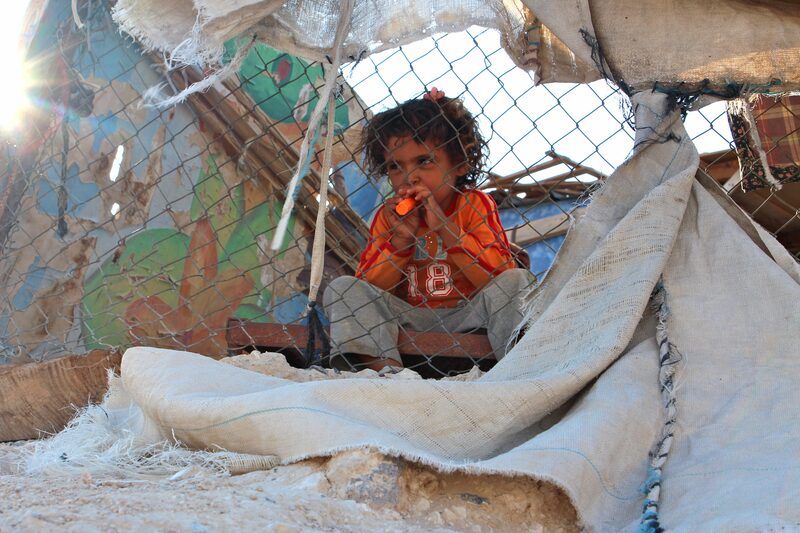 This is just one example of struggles children in Palestine face in Accessing Education. *Read about our Access to Education project. This Friday, September 13, marks the 20th Anniversary of the Oslo accords. Although, this agreement was meant to be a temporary solution, today, Palestinian territory is still divided into Area A, B, C. In Area C, Israel completely controls militarily and civilly 60% of the West Bank and in Area B, Israel exercises military control. 20 years after Oslo, the village of Yatma sees daily the consequence of Israeli control in the area, especially its dire affects on the lives of schoolchildren. Yatma, located about 15 kilometers south of Nablus is next to the Israeli settlement of Rechalim. In between Yatma and Rechalim lies Road 50, a source of continued tension and difficulties for the village of Yatma, especially hindering education. Most boys from Yatma attend school on the opposite side of Road 50 from Yatma and they must walk on Road 50 on their way to school. The settlers from Rechalim, however, often complain to the Israeli military if boys from Yatma come to close to their settlement on Road 50. In 2011, the situation came to a head when the Israeli army arrested 16 Yatma teenagers, accusing them of using Road 50 and throwing stones. The teenagers confessed that they were walking on Road 50, but only to go to school. As a result of signing a confession which the boys could not read the Israeli authorities sentenced the boys to 20 to 35 months in prison. Two have been released, but the rest remain in prison. After this incident, the village of Yatma decided that they would send their teenage boys of Yatma to another school until the age of 17. “This is not the ideal for our students, but I see no other way for our boys to receive a good education,” described the mayor of Yatma. A new school doesn’t solve everything. The Israeli occupation affects boys schools especially, as Israeli soldiers are present primarily around boys schools, explains Dr. Mohammed Awwad, Director of Education for the Palestinian Authority. For this reason, the village of Yatma requested the presence of EAPPI for protection as boys go to school. Dr. Awwad praises EAPPI, saying, “students feel safer if you are there.” Not only does EAPPI presence protect boys from Israeli military violence, it also reduces the amount boys dropping out of school and enables them to finish their secondary school education. Access to education, both primary and secondary education, is a basic human right for children and is stipulated in both Article 26 of the Universal Declaration of Human Rights and Article 14 of the International Covenant on Economic, Social and Cultural Rights. In light of the 20th Anniversary of the Oslo Accords, children’s right to education suffers under the shadow of continued Israeli control in over 60% of the West Bank. Yatma, is one village of many, where ensuring a bright future for the next generation is a constant struggle. International humanitarian law and international human rights law are central to the work of EAPPI. One of our tasks is to monitor children’s access to education. We stand at checkpoints or gates where children have to cross on their way to and from school. We watch to see that soldiers behave appropriately towards them. Where it’s necessary, EAs walk with children through checkpoints. But I recently came across a new problem for children in simply getting to school. Last week I was with our EAPPI team in Jerusalem for a few days. We visited Ka’abne, a small Bedouin village of about sixty people, near Adam settlement, not far from A Ram, between Jerusalem and Ramallah. We went because we had heard that they had received a stop work order; if they took no action, this could quickly be followed by a demolition order, and then by the demolition of the tent in which some of them were living. As we spoke to the adults, the children were playing round about us. It was natural to ask about their school. Mohammed, the man who had received the stop work order, told us that his children, like the other kids in the village, go to a school on the other side of a busy main road, which cars speed along. We watched the traffic on the road; it would be dangerous for an adult to attempt to cross it, let alone a child. ‘How do the children go to school?’ we asked. 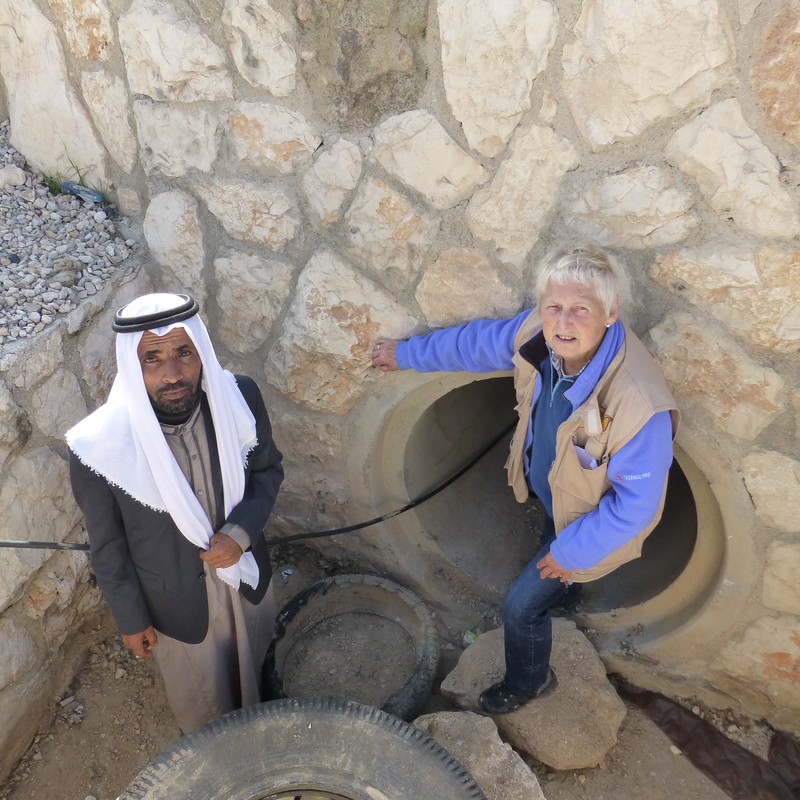 ‘They go through the tunnel,’ Mohammed said. He and his brother told us that the tunnel was only 60cm high. To be honest, I was sceptical. That seemed very little. So we went to have a look. As you can see from the photos, the tunnel is very small indeed. Going through it, the children have to crouch all the way along. With a school rucksack on your back it must be really difficult. My fellow EA, Keith, and I reckoned that the tunnel was about twelve metres long. It’s not just the size that’s a problem. It’s really more of a culvert than a tunnel. When it rains, the tunnel has several inches of water in it. One of the children told me that his teacher had sent him home from school one day because his trousers were so wet. The children said that in the summer there are snakes, which is especially frightening for the little ones. The children were full of fun, and a couple of the boys grinned as I was hauled out and up from inspecting the tunnel. 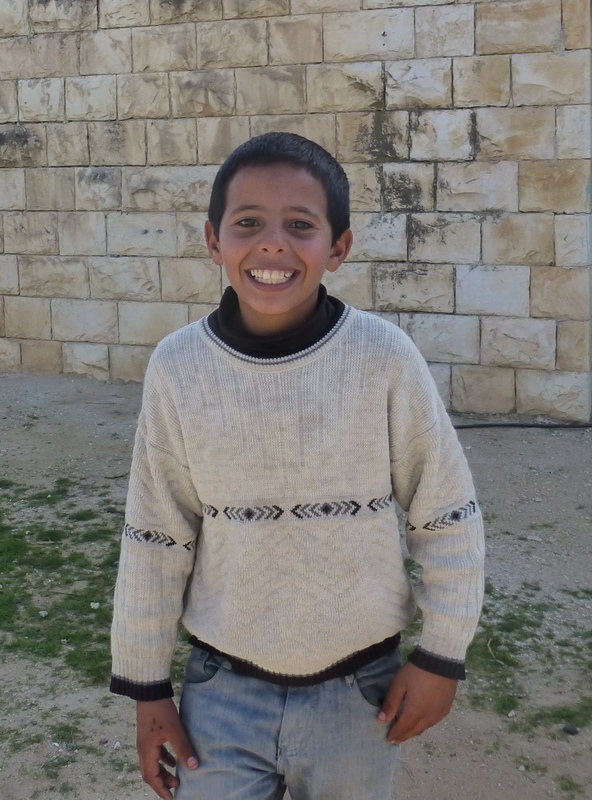 Mohammed’s son, Abdullah, told us that his ambition is to be a lawyer. He said that he likes school. ‘But I don’t like the tunnel,’ he said. The Fourth Geneva Convention 1949 explicitly states that an Occupying Power assumes responsibility for ensuring the provision of services to the population of the territory it is occupying. The children I met in this small community, like children everywhere, have the right to education. Don’t they have a right to better access too? And doesn’t Israel have a responsibility to ensure that access?